A brown butter sauce is one of those simple recipes that really needs to be in your repertoire. It’s really very simple, because there’s one key ingredient – butter. It’s really very versatile, because while there’s only one key ingredient, that will go well with hundreds of others. Finally, almost everyone has butter in the fridge, so at home or if you’re cooking at a friend’s house, it’s almost always something you can do. In a brown butter sauce, you allow the butter to melt down in a pan over medium high heat, and after a few minutes, the milk solids that are in the butter, will start to brown and form little tiny bits/specks near the bottom of the plan. The flavor of the butter changes, and becomes rich, nuttier and I think a little bit saltier. In itself the butter tastes great, but then adding a few other ingredients, it’s can become some magical. The only big mistake that people make when doing a brown butter sauce is burning the butter – which can happen pretty quickly. Most of time when the butter burns, the pan was too hot to start with, or people walk away and forget to check back often enough. I think it’s pretty clear on to prevent the second issue. To make sure the pan’s not too hot, I like to use medium heat, and when it doubt, you can start at lower temperature, and just let it go longer and/or turn it up as the butter melts. Here I’m going to describe a sage brown butter sauce, which goes really well with pasta’s. 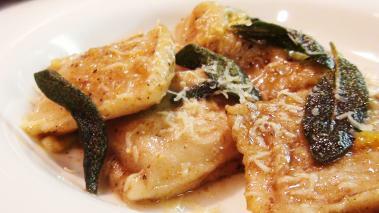 Especially stuffed pasta like ravioli with pumpkin or squash fillings. You can practice this sage brown butter sauce, but then experiment with other flavors. I’ve put a few ideas below. Once browned you’re good to go. I generally like to toss pasta directly into the sauce, but you can certainly pour sauce directly over your dish. No offense but there were so many typos and misspellings in this I stopped reading. Have someone double check your recipes before you post them. I agree with Aurora. You do not want to continue reading instructions when you cannot read it with a flow. "If you’re adding additional flavors not is the time to do it" I'm confused, it's not time to add additional flavors or it is time to add other ingredients?